Muriel was born in Vancouver and was a life‑long resident of her beloved city until she passed away peacefully on February 1, 2013, in her 100th year. Muriel grew up in Point Grey and attended Prince of Wales Secondary School. While at UBC, she was a member of Alpha Phi sorority, and later an active member of the University Women’s Club. 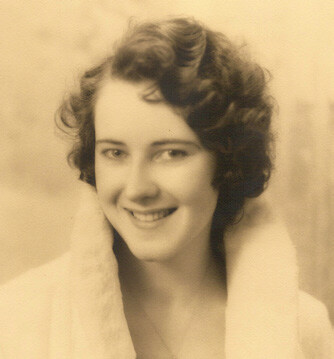 Muriel often commented that her time at UBC was one of the best times of her life. After graduating, she worked for the Vancouver Sun Publishing Company, and later as a manager of a small local business. At a dude ranch in the late 1930s she met a fellow lover of horses, Herb Call, with whom she spent 10 happily married years. After Herb’s death Muriel began a career as an English teacher, retiring from Sir Winston Churchill Secondary School in 1976. Retirement gave Muriel the opportunity to pursue her passion and talent for painting. She was a member of the Canadian Federation of Artists. Muriel loved to paint trees, travel the world, listen to classical music, read a good book, play golf and bridge, and enjoyed a lively discussion. She has left her family a legacy of strong values, independent thinking, and appreciation of beautiful things. Muriel is survived by her sons, Ron, BCom’66, (Christel) of Oakville and Lony, BA’69, of Galiano Island; her grandchildren, Kirsten, Tahirih, Josli, Christopher and Oleann; and her nephews, Stephen and Michael Town of Seattle and David Town of Anaheim. She is predeceased by her husband, Sydney Herbert Call; her parents, PJ and Evelyn Salter; and her sisters, Phyllis Salter and Audree Town, BA’39. This report was read in England for the first time on 31 December 2018 by the grandson of Muriel’s aunt, Mabel Gertrude Morley (sister to her mother), who died way back in 1944. Muriel’s mother, Evelyn was one of the Morley sisters, who emigrated from England to Canada in about 1914, four years before her father’s death (William Austin Morley d.1918). I met Muriel for the last time in 1997 in her Kerrisdale apartment on a visit to Vancouver. Another piece of family history gone. May she Rest in Peace.